One of the lesser known variants, London Bridge is a style of community card poker and arguably not particularly suitable for strategic betting. You’ll be unlikely to find it in casinos and it’s far more suited to home games. Community card poker is a form in which a number of cards (usually five) are placed face-up on the table by the dealer and shared by all players. 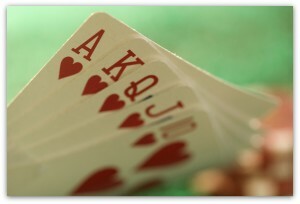 The aim of London Bridge is to create the strongest five card hand according to standard high poker rankings. Betting can take place in the form of antes or blinds. The main difference between London Bridge and other poker variants is that Aces, twos and threes are wild; make sure everyone is clear about these rules before the game starts. The flop of three cards now takes place after which players must discard one card, leaving them with three. The turn and the river follow with betting rounds taking place after all three community card deals. If more than one player remains in the game following the final betting round, the showdown takes place in which cards are compared according to standard poker rankings. Hands can comprise five from any of the hole cards or community cards. The wilds introduce a large element of luck into proceedings, especially when occurring among the community cards which is why we regard this is a fun home game rather than anything more serious.